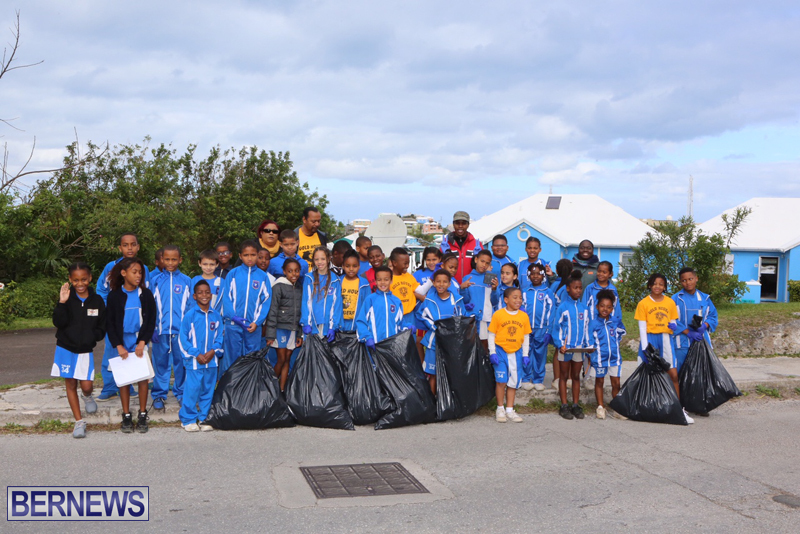 On Friday, Elliot Primary School and Keep Bermuda Beautiful [KBB] teamed up to clean up parts of Devonshire, with the school children leading by example in giving their time to help clean up the island. Students picked up trash in the Vesey Street, Penhurst Park, and Devon Springs areas, combining for a full community effort. Leading up to the event, Executive Director of KBB Anne Hyde spoke at an Elliot Primary School assembly, informing students about the organization and its work, as well as educating them about the importance of recycling and not littering. An Elliot spokesperson said, “Once per term, Elliot Primary School students participate in various community service activities at different locations such as the hospitals, rest homes, nurseries, and farms. Our kids makes us proud, they take care of their beautiful island, this is why Bermuda is the way it is. Bermudians have maintained this way, no like other much bigger islands over populated and dirty.I hope Bermuda remains beautiful and clean. Well done Elliott School Family, nice effort, a really good effort since you realise, some just throw their empty bottles and bags, etc in the trees or by the road side. It was also good that the KBB spoke about the need to recycle. Again, well done.